I didn't want salty fried food. I wanted it to be relatively healthy. Two out of three isn't bad, trust me. Why not completely healthy? It turned out to be a bit high in sugar since the recipe calls for a cup of honey. Yes, a full cup of honey. You'll want to get the stuff at the wholesale store where it is cheaper. But, it's easy. I'm good with a wok. We buy chicken in 10 pound packs for the restaurant trade, so I repack it in thirds. Two pounds or so go into the first meal. The second was a simple stir fry with the leftovers. I've been using one since the 80s when a good friend gave me one for my birthday, and I still use it to this day. The idea is to trim your meats down into bite sized chunks and toss it in the sauce that you already made up in the crock pot. You allow it to cook until done, which according to the USDA is 165F internal temperature. Then separate out the chicken and pour the sauce into a sauce pan. Put the sauce on medium heat and cook until thickened. Add Cornstarch if you find that the sauce is too thin. I did. The other helpful hint I can give you is that you need some good kitchen shears. Scissors to the rest of the world. Something that you can take a chicken breast and snip the chunks off to the right size. Much quicker than using a knife or cleaver. The trick is that chunks cook faster than a large piece of meat. So watch the temperature closely starting at 3 hours in the crock pot. Over cooked chicken is tough and unappetizing. This recipe can be made with chicken, pork, turkey, tofu or any other mild meats. I have had it with Beef and thought it was a bit of an odd choice for sauces. Since it served six, and I'm generous on serving sizes, it was well worth the honey that I poured into it. Oh and it tasted better than what you'll find out in the restaurants because you aren't hit by a wall of salt! 2½ lbs boneless, skinless chicken parts, turkey, tofu, or other meats could be substituted. Add to the crock pot and mix together: honey, low-sodium soy sauce, sesame oil, olive oil, garlic, onion, barbecue sauce and crushed red peppers. Cut up the chicken parts and add to the crock pot with the sauce. Mix well. Cook on low for about 3 1/2 hours to 4 hours or until chicken reaches 165F. Remove chicken from crock pot setting it aside in a separate bowl. Add sauce from crock pot to a sauce pan and cook on medium heat until it reduces and thickens. If needed, add cornstarch slowly to help the thickening. When sauce is thick, add the chicken back to the sauce and coat the chicken. 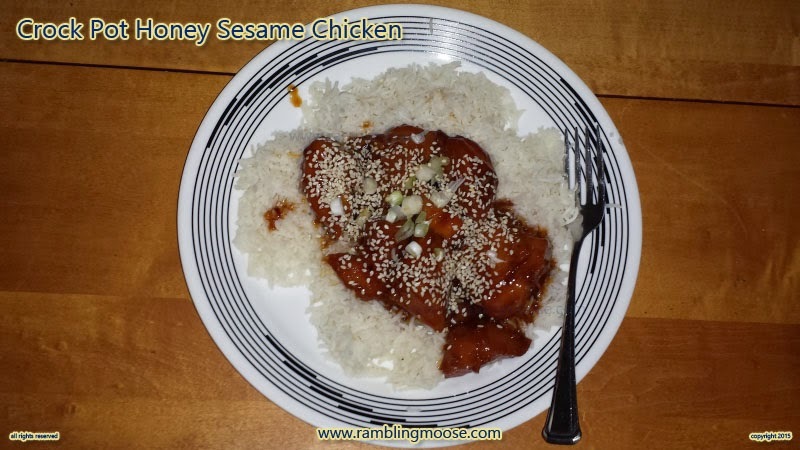 Serve on rice with sesame seeds and green onions, to taste. This was adapted from Six Sisters Stuff and the original recipe is right here.